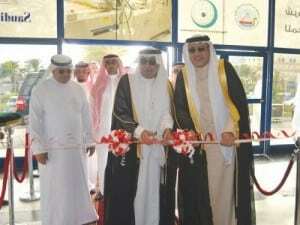 JEDDAH — On behalf of the Minister of Agriculture of the Kingdom of Saudi Arabia, the Director General of Agricultural Affairs of the Makkah Al Mukarramah region, Engineer Hassan Bin Obaid Sankouf, officially inaugurated on Monday night Food, Hotel and Hospitality Arabia 2015 exhibition at Jeddah Center for Forums and Events. The exhibition opens its doors until April 16 from 4-10 p.m. Accompanied by Zahoor Siddique, Vice President of Al Harithy Company for Exhibitions (ACE), Eng. Sankouf and a number of senior officials attended the opening ceremony. The VIP delegation toured the exhibition halls in the presence of Arab Diplomats and the Representatives of the Pavilions of participating countries as well as businessmen from Member States operating in the field of Agribusiness industries. Held annually by ACE, the event brings together professionals involved in buying and selling food products, services and equipment in addition to the latest innovations in the food industry. In his statement, Eng. Sankouf, expressed deep satisfaction at the large participation of Food, Hotel and Hospitality Arabia 2015 and the excellent position of this biggest trade event in the field of agribusiness industries and hotel industry at the level of the whole area. Besides, Zahoor Siddique put emphasis on the continuous progress of this exhibition resulting from the quick changes experienced by the agribusiness and hotel industries and related services at international level and the increasing demand of the Saudi Population. The exhibition gathers more than 350 local and international companies from Saudi Arabia, Bahrain, China, Cyprus, Egypt, India, Indonesia, Italy, Jordan, Lebanon, Malaysia, Morocco, Pakistan, South Africa, Spain, Sri Lanka, Thailand, Turkey and USA. On the sidelines of the fair, the Top Chef Contest and the Art Table Competitions are sponsored by Nestle and organized by the Saudi Arabian Chefs Association in which the best chefs display their culinary skills and best table display from famous hotels and restaurants under the supervision of a jury composed of international experts.